Dr. Jørgen Bendtsen, ClimateLab Denmark., Professor Katherine Richardson, Centre for Macroecology, Evolution and Climate, Natural History Museum of Denmark, University of Copenhagen. Deployment of the VMP-250 from the R/V Dana in the North Sea, July 2016. The instrument is deployed ~5 m from the free-drifting ship, and after it has been lowered to the surface the line is released and it sinks freely through the water column. The ClimateLab and University of Copenhagen purchased a VMP-250 coastal turbulence profiler and Jørgen attended instrument training at Rockland Scientific in June 2016. 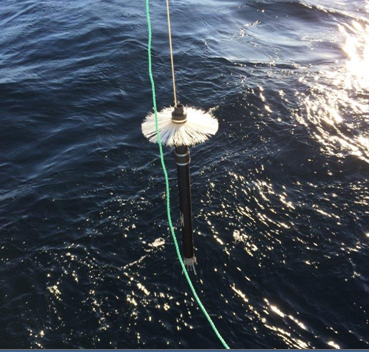 Shortly after, Jørgen used the instrument as part of a nutrient flux study in the North Sea. The ClimateLab and U Copenhagen team collected turbulence data from the VMP-250 and analyzed the potential for vertical mixing, which can transport nutrients, such as nitrate, which support primary production throughout the column. The findings were published last month in the paper Turbulence measurements suggest high rates of new production over the shelf edge in the northeastern North Sea during the summer in the Biogeosiences Journal. The key finding of this research paper was based on measurements taken in the northeastern North Sea. During the stratified summer season a deep chlorophyll maximum was found at the bottom of the nutrient depleted surface layer (~20 m). Observations with the VMP-250 along transects across the shelf edge towards the deep northern North Sea (>500 m) showed enhanced vertical mixing at the bottom of the nutricline above the shelf edge. Diapycnal turbulent nitrate fluxes were estimated from turbulence measurements and nutrient samples and showed enhanced new production above the shelf edge area. Overall, this suggests that the shelf-edge zone may be the major nutrient supplier to the euphotic zone in this area during the period of summer stratification. These findings will have impacts on fisheries, aquaculture, and ecological conservation efforts and policy. Dr. Bendtsen and Professor Richardson’s success with the VMP-250 has resulted in some additional funding to add a fluorometer/turbidity sensor to their VMP-250 instrument. This is good news for Rockland and their customer base as Jørgen is well positioned to perform novel science with high resolution measurements of chlorophyll-a and turbidity taken very close to the shear probes.